Jazz at Lincoln Center and JazzTimes have joined forces to co-produce the Jazz Congress, a new annual conference designed to bring together artists, media and industry leaders in the global jazz community to exchange ideas that will nurture and grow the jazz community and the underlying businesses and organizations that promote, produce, present, market and support the music. The 2018 Jazz Congress, featuring a series of panels, workshops, meetings and performances, will be held on January 11-12, 2018, at Frederick P. Rose Hall, home of Jazz at Lincoln Center, located at Broadway at 60th Street, New York, N.Y. 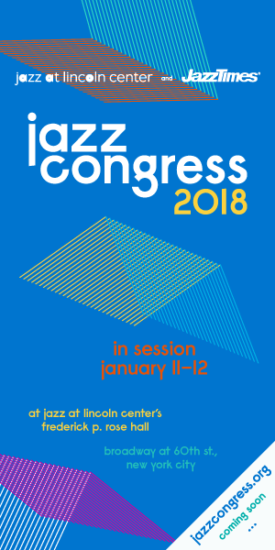 The 2018 Jazz Congress schedule of events will be announced soon. JazzTimes has been organizing confabs for the jazz industry since 1979, when it first hosted the Radio Free Jazz Convention, later the JazzTimes Convention, which was held until 1998. Beginning in 2000, JazzTimes partnered with the International Association for Jazz Education (IAJE) to create the Industry Track as part of that organization’s annual conference. After IAJE folded in 2009, the magazine created a DIY Crash Course at the Association of Performing Arts Presenters (APAP) conference in 2011. Working with a consortium of organizations and individuals, the Jazz Connect Conference followed in 2012 and took place as a pre-conference at the APAP event for three years. The conference moved as a stand-alone event to Saint Peter’s Church in 2015, where it was held for the next three years, presented with the Jazz Forward Coalition. Among the keynote speakers at the Jazz Connect Conference were Maria Schneider (2017), Dee Dee Bridgewater (2016) and Christian McBride (2015). Please visit jazzcongress.org for more information.